This myth has now been thoroughly debunked by a Grattan Institute report Keep calm and carry on: Managing electricity reliability. Blaming renewables for reliability issues is “wrong and dangerous”. 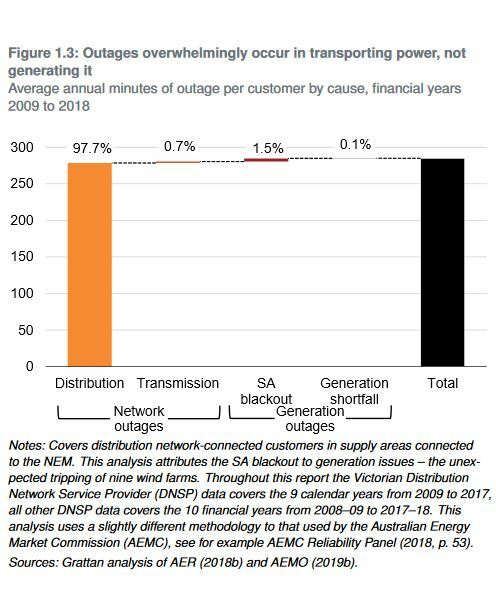 shows the idea is wrong because almost all outages are caused by problems in transporting electricity, and have nothing to do with whether the power was generated from new renewables or old coal or some other technology. And it’s dangerous because if politicians over-react to public concern and rush to intervene in the market, electricity bills could rise even higher. 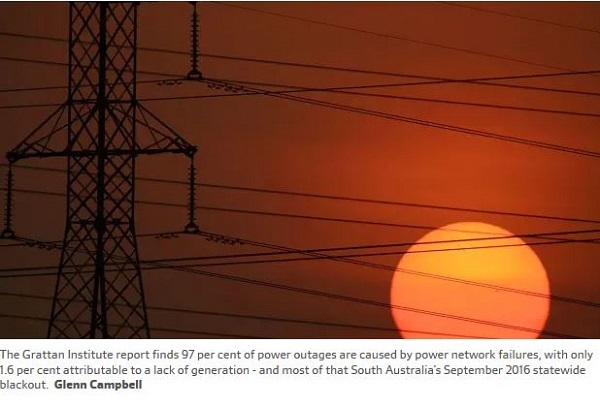 See also BoM says 260km/h winds knocked down network in S.A. blackout. That leaves 0.1% attributable to generation source, which includes fossil fuel generators failing in the heat. The Commonwealth should understand that it has one vote on the COAG Energy Council, which operates by consensus. NEM legislation by convention since 1996 has been SA legislation first, then replicated in the other jurisdictions. The Commonwealth’s head of power comes through its foreign affairs responsibility and its involvement in the Kyoto and Paris agreements. The Commonwealth sets the targets, which, under the excellent institutional architecture set up by the Gillard government with the Greens and independents, used to be formulated by the Climate Change Authority to de-politicise the function. The Gillard architecture also established national organs such as ARENA and the Clean Energy Finance Corporation (CEFC) to stimulate the transition to clean energy. After the Finkel Review, I understand all that the Commonwealth as such had to legislate was the targets, best framed in the context of a national energy policy to give everyone, including industry players confidence. The main issue now has become an assurance that the Commonwealth won’t take unilateral action on the basis of a confected crisis. 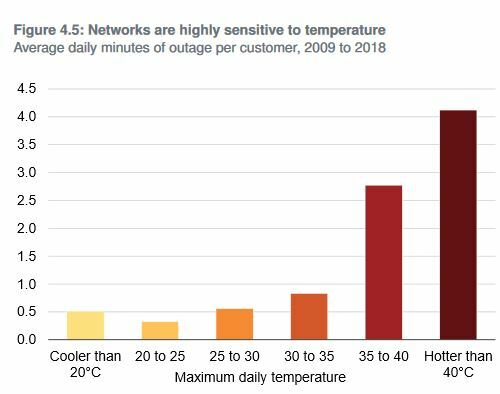 There is indeed something of a crisis in power prices, appropriately investigated by the ACCC, but the genesis of this crisis is more about the gold-plating of the networks, retailer behaviour, and, ironically, the lack of a national policy framework. 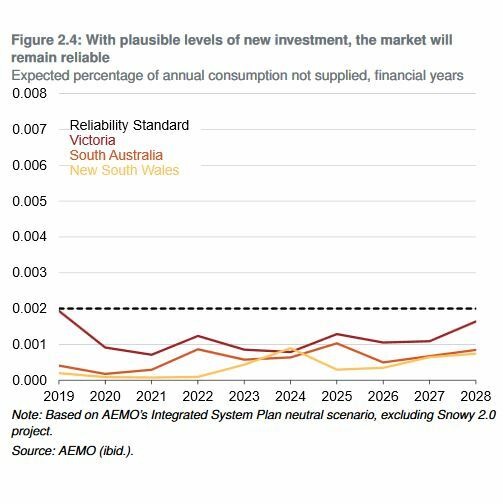 The Grattan report has debunked the notion, stirred by the Commonwealth government, that there is a reliability crisis stemming from intermittent renewable power. 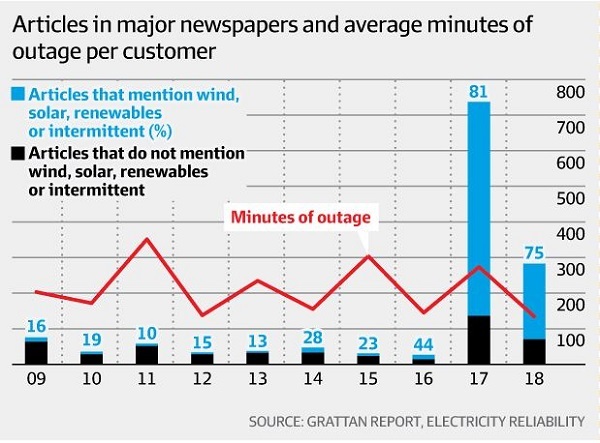 For the genesis of the crisis myth see for example, After the blackout, a new dawn for renewable energy, and Renewables under attack – again in October 2016, then Turnbull goes feral on electricity from September 2017. Then remember this in What the biffo between Weatherill and Frydenberg really means? Investors need to know that the Commonwealth government will stick to its constitutional role. Instead ScoMo has put an activist Coalshevik in charge which creates sovereign risk. That in turn either results in inaction, or action with the risk priced in. the way to get that investment is to achieve something the government has failed to achieve over the last five years – develop a coherent emissions and energy policy. We can argue about the detail, but the main message is that there is no crisis in reliability, keep calm and carry on. Way out here in The Other Australia – Australia’s very own Third World -where a lot of essential services and facilities are luxuries for us, we have been little troubled by blackouts. Yes, we have had a few but not many at all. Many locals, influenced by “cash-for-comments” in the mainstream media , believe this happy situation is proof of the reliability of coal-fired power stations.. I see no such proof. Rather, I suggest our demand, in contrast to that in the major cities, is gradually increased and decreased and thus very predictable. It would be a strange day indeed if everyone turned on their water pumps, welders, etc. at the same moment . Although much electricity demand in major cities is predictable, the opportunities for massive, abrupt surges in demand are likely to be far greater, hence, there would be more opportunities for blackouts, regardless of the sources of the power.. Sorry, no hard statistics to back up my opinion; just anecdotal stuff. Much of the harm done by blackouts in urban households and businesses seems to come from a lack of preparedness. We have rechargeable lights, radios, a cooling fan and the like as well as a good old spirits stove and a little camping fridge. If we can be this well-prepared, on our meagre income, then surely this basic level of preparedness is not beyond the ability of most of urban dwellers. As for businesses, ever hear of portable generators? Some may use them but, in a blackout, a lot seem to just wait for the fairies to waft along and restore their magical electricity at the wave of a wand. Part of the problem with coal fired is that the generators are large. The relatively new Kogan creek power station has single 750 MW generator. Suddenly losing 750 MW causes a major disruption, made worse by the time it takes to bring another coal fired generator online. To make matters worse our crazy spot market means that generators only get paid when they sell power. Some generators may decide that they won’t start up in anticipation of increased demand because they don’t think it will be worth it. By contrast wind, solar and batteries have much smaller units that cause less disruption if something goes wrong and can be brought on and off-line quickly. Not only are coal units very large, but as you and others have pointed out, it takes a darned long time to “crank them up”. Tricky when the spot market works in blocks of… 5 minutes, is it? high-intensity low-emissions coal-fired power, eh? 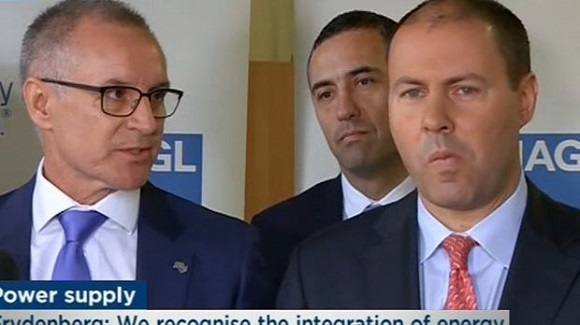 That Jay Wetherill dump on Frydenberg was a gem that we rarely get to enjoy so openly. Equipment failures, falling trees, inquisitive animals and crashing cars can all cause the power to go out in the local distribution network. 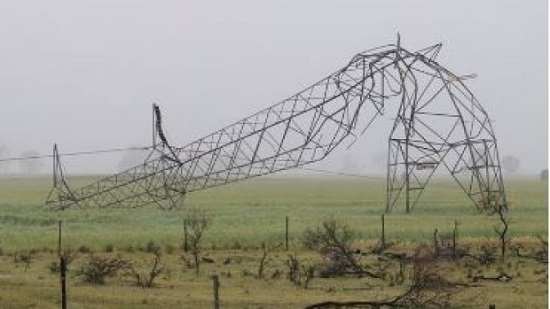 In SEQ blackouts are mostly caused by storms (lightning strikes, wind bringing branches onto wires etc. For some reason we almost never seem to be affected. Could be we are get protection from Mt Coot-tha. Have wondered whether having a fire station just up the road helps. And Government House nearby. I’ve wondered how Energex can put 500 people into fixing outages after a storm at the drop of a hat. What do these people do during the rest of the time? Or Ergon. They had 82 trucks lined up outside on the road side near Rockhampton to fix things after Cyclone Debbie in 2017, waiting for the roads to clear. As I understand, the content of the compromise Bill in the US (to avoid a shutdown) places significant restrictions upon building of any wall or barrier along the US/Mexico border. There are the so-called “land mines” embedded in the bipartisan Bill, and the building restriction is one of them. It may mean that even if Trump did get the money it could not be legally used to build his wall. What happens with the declaration of a national emergency remains to be seen but court challenges are a certainty. These may flow on into 2020, and Trump may not even be President by then. In other geopolitical stuff, Vanuatu is struggling to maintain its Chinese-built convention centre but has contracted a Chinese firm to maintain it anyway. Designed by the Chinese, the centre is not the preferred venue for conventions it seems. It looks like another example of fiscal entrapment by the Chinese, similar to the port built in Sri Lanka. A report from PNG says that most of the special vehicles imported (including the Maserati’s) have not been returned to the government as intended. The vehicles were supposed to be sold to defray the cost of November’s ASEAN Summit. My friend who (embarrassingly) lives in Tony Abbott’s electorate say’s he thinks Abbott has a fair chance of making it back into parliament. He has no objective reason to think that, it is just an impression he gets from conversations he has had over the past year. Geoff H, great comment, but should it not be in Weekly salon? 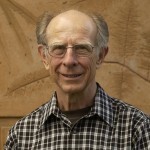 JD: You hit the nail on the head when you called it the crazy spot market – but try telling that to those fanatical decision-makers, the “Red Guards” of economics and energy production. GB: The power system would work better if long term contracts for capacity replaced the spot market.